One thread of Maria Fernanda’s varied art practice involves repetitive ordering of objects collected or derived from Nature to create works of suggestive sculptural presence, striking beauty and visual complexity. She has created significant works with emu feathers, wool, living plants, the bodies of frogs, butterflies, lizards, starfish and other creatures, and is currently engaged in the creation of a public art project in Sydney involving a mass planting of Australian bottle trees (Brachychiton rupestris). During her 2008 bush camping experience, and with the Tjanpi women’s permission and assistance, Maria Fernanda hand-collected hundreds of the large distinctively gnarled seedpods of Eucalyptus macrocarpa – a common tree of the red desert country. 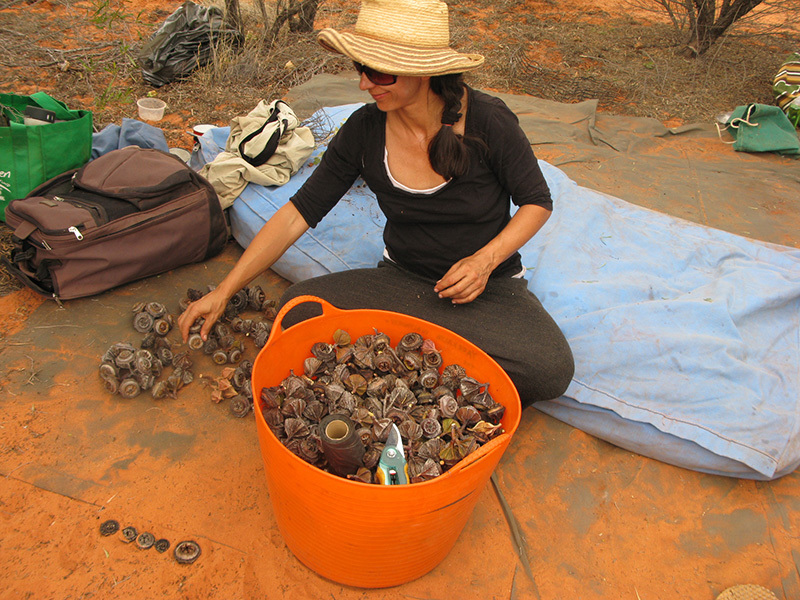 For Fieldwork, Maria Fernanda is showing Gumnuts, the work she made with that 50 litre bucket of pods, created originally for the Tjanpi Desert Weavers exhibition Kuru Alala Eyes Open. 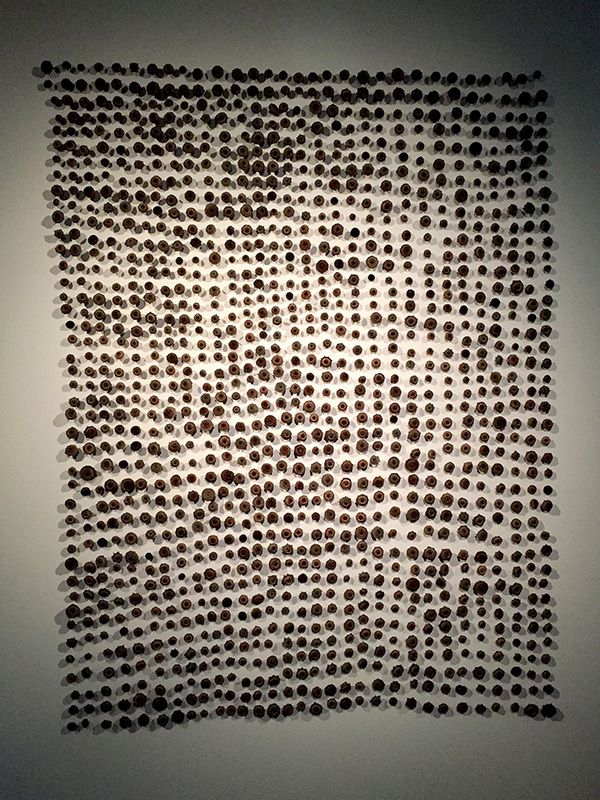 It comprises approximately 1,300 of the desert harvested gumnuts, each meticulously prepared for wall-mounting in a grid formation. But the geometric imposition of a Cartesian grid on these organic unit elements is keenly subverted by the phenotypic variation of the pods, creating a strong vibratory visual image redolent of Op Art and resonant with an unmistakably Australian materiality.